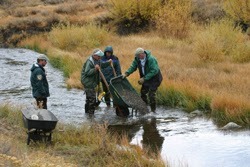 Placing trout gravel in streambed. areas. The date is October 20, 2013. Volunteers will be treated to a celebration party from 1:00pm to 4:00pm at the Granite Flat Campground on Hwy. 89. The party features live music and entertainment, Red Truck food, educational activities, and a Lahontan Cutthroat Trout release. All volunteers must register on the TRWC website to participate. You can choose to participate at any one of six "all day" projects. The all day projects are: Donner Lake Boat Ramp, Tahoe Donner Tree Planting, Coldsteam Canyon, Prosser Creek Spawning Gravel, Johnson Canyon Trail Relocation, and Martis Wildlife Area Trail Maintenance. "Half day" projects include: Little Truckee River Campground Trail Maintenance, Sugar Pine Planting, Truckee Revegetation, Milfoil Barrier, Barbed wire removal, Boardwalk construction, and New Zealand Mud Snail surveys. Sign up now and get the best choices. The event will take place rain or shine.